The Steel Detailer Drawings manages all the documents associated to a logged on project. Instead of searching for all the drawings filed in a project have The Steel detailer find them for you so that you can update the templates to match the projects drawing templates. 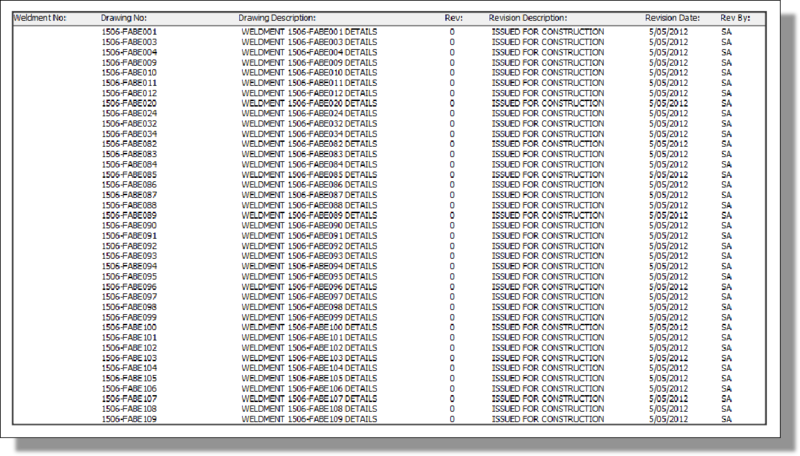 Automatically fill in the drawing title block data with the logged in projects data. Instead of searching through windows directories for drawings, The Steel Detailer gives the user the ability to filter drawings in a project to meet certain criteria. This is created in order to modify multiple drawings in a certain way. This way could be updating BOM's, updating sheet templates based on drawing type. Imagine that you have just modified several drawings and the totals have been effected or the sizes of the sections or plates have been modified. Now you have to bump up the revision on all of them. You are given the option to bump the revision on all drawings in one go or modify the existing revision. For a quick revision update select the description to be issued for construction. Imagine slowly going through multiple drawing and bumping the revision from approval to construction. Why not use The Steel Detailer and have it do it for you automatically? Imagine you have hundreds of drawings and you are required to change the project details. One by one would be painful, wouldn’t it. But with The Steel Detailer you can have each drawing updated automatically. So you have to make PDF's, DWG's or DXF's for a client. Why not use the steel detailer and have it completed in one fast swoop. Multiple sheets are also included. After filtering the drawings you require for your project in the document manager, you can export a complete list for a document register in excel complete with all of the drawings revisions. Automated punching drawings for purlins, girts, joists and fascia. No more manual typing of data. The drawing templates contain a quick way of punching cold rolled sections. Create cut lists for steel ordering before the drafting of the project is totally completed. Create bolt schedules for the entire project. There are two options available to use such as obtaining the total bolts used or total bolts sorted by members. Create individual reports for sections, plates and vendor items. So you created a project and there is hundreds of plates and the client has just asked you to save them all for plasma cutting. The Steel Detailer’s Dxf Plate Creator collects all of the plates in the project and saves each one as a dxf one after the other. No more repetative processes here, it’s all automated. The Section Blockout Function Follows on from the Grid Lines and Reduced level Insertion of parts. By opening an area assembly containing Grid Lines and Reduced Level Parts and Selecting Get RL, EL and Grid Parts Button a list of the specified parts are added to the list. By Selecting the Green Tick, each part contains a Blockout sketch that is used to create the Blockouts. The Blockouts are Extruded Cuts inside the Assembly containing all of the parts in assembly in the cut. The Cut Name matches the Grid Letter or Number and the RL/EL annotation. The Blockout Name is also used as a Configuration. Each Configuration can be selected resulting in the specific extruded cut (Blockout) to turn on. This process removes the standard sections in SolidWorks drawings and is much faster. Be prepared to wait when running this process as it will go through and create as many configurations as there are grids lines and reduced levels. The following process of automating General Arrangements requires this process. The General Arrangement Function automates the process of creating Marking and General Arrangement Drawings. Combined with the Grid Lines, Reduced Levels and Section Blockouts Marking and General Arrangement Drawings can be created. It is advisable to have open the assembly of the model to which the Marking or General Arrangement Drawings are to be created from. It will speed up the process otherwise it will load the assembly every time as it creates the drawings which can be much slower. The Steel pricing manager can be used to create templates which can be setup to group Section profile types and sizes based on the project & or current work requirements. Allocation of pricing can be imputed based on the Liner or Weight units depending on what is required. The Quote Manager tool aids in the laborious tasks of calculating the Material costs involved within a specified project. This tool can be used in a number of different ways depending on what the final output data is required. 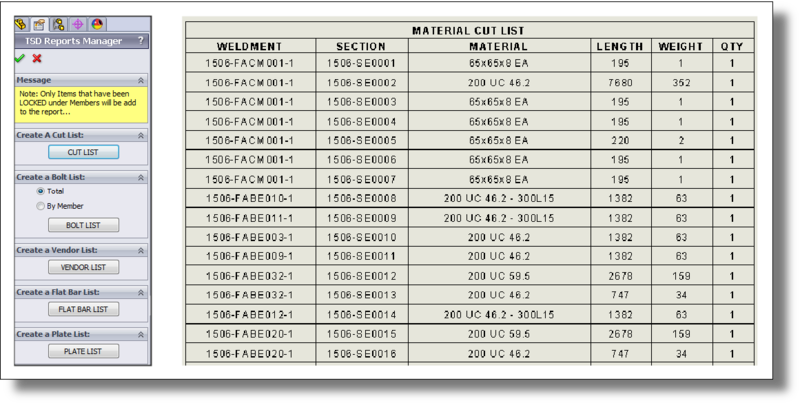 • Summary table of Material Sections with cost per liner metre or by weight options. • Table filters to select required section profiles and plates etc..
• Total quantity, weight & lengths of materials required for the whole project. • Produces a excel based spreadsheet output of the report. 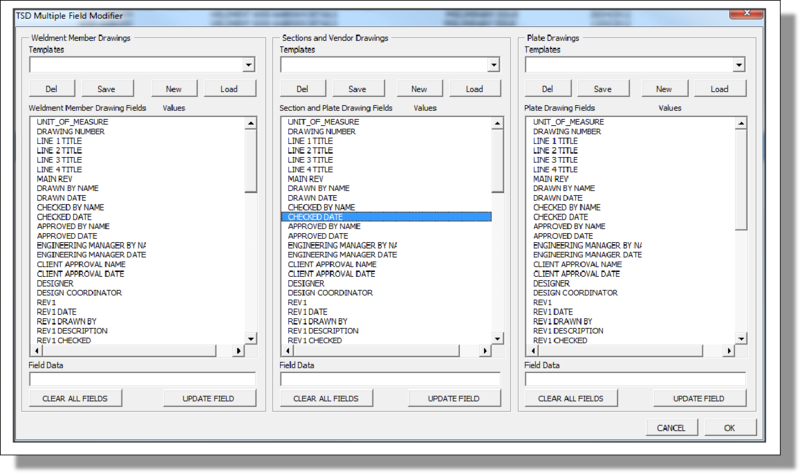 Create reports from model data using preselected model items to filter the selections. By selected weldment profile sizes from the weldment profile list and placing the selection into light, medium and heavy categories, placing named assemblies in Length, volume and Surface area a report isolating the totals for these filters can be created. 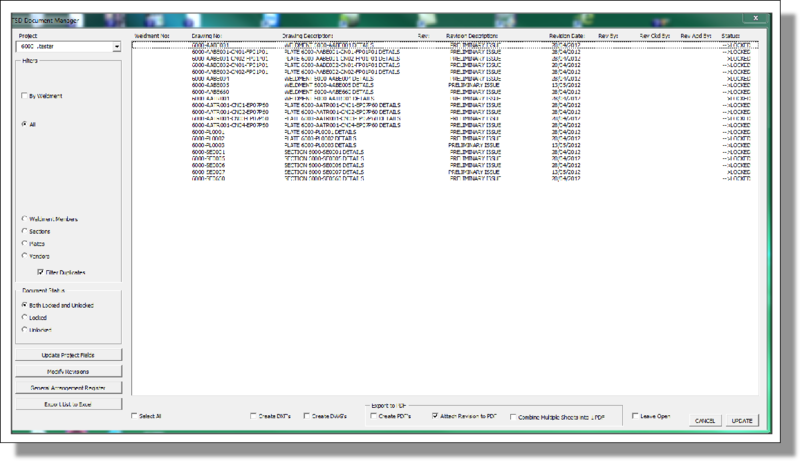 Reports can be exported to excel giving lists of the sections in light weight, medium weight, heavy weight, volume, vendor supplied items, surface are of grating, lengths of handrailing, volumes of concrete and even the quantity of bolt based on sizes, lengths and grades on each page of a spreadsheet within one workbook.